AP Racing, the globally renowned brake and clutch system manufacturer, is extremely proud to have scooped a prestigious motorsport industry award recognising its efforts in penetrating overseas markets. 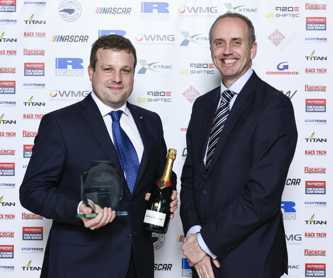 Based in Coventry, AP Racing took the Export Achievement category against strong competition at the annual Motorsport Industry Association Business Excellence Awards, held at Birmingham’s National Exhibition Centre. AP Racing’s Managing Director, David Hamblin, collected the award from Archie MacPherson, CEO of the WMG Centre High Value Manufacturing Catapult. Held annually, the Awards recognise excellence in business performance among companies working in, or serving, the motorsport sector. Operating in the motorsport sector for more than 50 years, AP Racing employs around 200 people at its Coventry facility, with its main export markets including the USA, continental Europe and Asia. Every Formula One Championship since 1967 has been won using AP Racing’s equipment and the company supplied brakes and clutches to more than 30 champions across the motorsport world in 2018 alone.